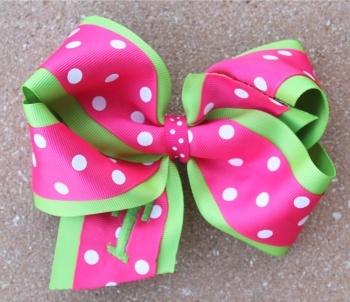 Cute and Sassy Polka Dot Bow! Double Layered bow with lime green grosgrain on the bottom and hot pink on the top. White polka dots perfect this cute bow. Add on embroidery as pictured and get a one inch first initial on the front tail of bow. Mono curls font usually done, the above picture is a quiver font picked by customer. Color of thread can be picked for embroidery, if added.